A typical PC or Mac recording setup may contain software and hardware products from a dozen or more companies. i.e. Dell, Microsoft, Belkin, Steinberg, Syncrosoft, Waves, Universal Audio, Arturia, FXpansion, Native Instruments, Akai Pro, Alesis. What is Latency and how does it effect me? When is low latency important? When is low latency not important? You can’t walk into a car dealership and buy a car that’s ready to enter a race. Even high-performance sports cars come tuned for the road, not the race track. Suspension, gearing, timing all need to be tweaked before a car is ready to be pushed to it’s limits. The same is true of computers. While most new computers will perform well right out of the box, whether you buy a Mac, or a PC, you still have some work to do before you’ll see your new computer perform to it’s maximum potential. Recording and mixing music is one of the most demanding tasks you can ask of your computer, sometimes more taxing than professional graphics and video work. The suggestions below can be used to squeeze more speed, more tracks, and more plugin-power out of any computer. Before you begin, make sure that your recording software and your audio device drivers are up-to-date. Of course, visit alesis.com for the latest drivers for any of our products. Don’t let your computer’s boot drive get too full. Make sure to leave about 20% of your computer’s main hard disk free for system tasks and virtual memory operations. This is crucial to maintain system speed. If your main hard disk gets more than 80% full, its time to go out and buy a second hard disk, or either get rid of some files. External USB and FireWire drives are more affordable than ever. For example, a Seagate 1TB External USB 2.0 drive is now less than $150!! Internal drives are even less expensive! While you’re at it, buy an extra drive just for backing up! Get more RAM. Your operating system can use up to 1GB of RAM all by itself. On a recording computer, you’ll want to have more than that so your power-hungry applications have all the resources they need. 2GB is a great place to start. If you’ll be using lots of virtual-instruments, samplers etc, you’ll want to get even more…think 3 or 4GB. Is there such thing as overkill? At this point, yes, there is. While many of today’s’ computers can accommodate 8GB or more of RAM, even in virtual-instrument and sample-heavy projects, it’s almost impossible to use up that much RAM. For the most part, the only time you’ll need 8GB of ram is in the Video and 3D modeling fields. If possible, record to a second hard disk. While even the 5400 RPM drives in most laptops can handle recording 8 or even 16 simultaneous tracks, you can really improve system performance by dedicating a 7200 RPM (or even 10,000 RPM drive to your recording projects. Certain files on your computer change all the time, like your email, internet search history, bookmarks, etc. Other files once they’re stored, stay more-or-less the same like music and photo libraries, large audio files etc. Your system will perform better, and won’t have to work as hard if you get a second drive to record on. This will result in less fragmented drive space, and faster loading and writing of large files. This is also makes things easier when it comes to backing up. Make sure to install the Microsoft fix for FireWire bandwidth under WinXP SP2 KB885222. Not all FireWire ports are considered equal. If the port on your computer performs poorly, or your device has problems being recognized, consider purchasing a new FireWire card from Belkin. Use the best ports on your computer for recording devices. If you have a desktop or a tower, be sure to connect your audio interface to a USB port that is on the back of the computer. Generally, ports on the front of the computer, on the monitor, or keyboard don’t perform as well as those on the back. This can help prevent noise, dropouts and connection issues. If you use hubs, use powered hubs. If you have to use a USB Hub to connect your device, use a hub that has its own AC power adapter. If necessary, upgrade to a premium USB cable. If you live in an area that has a high degree of radio or electrical interference, and you experience noise or hum when using USB audio, upgrade your USB cable to a premium cable with extra shielding and a Ferrite Bead (a cylindrical bump on one end of the cable) which can filter out some external noise. Make sure your Windows installation is up-to-date. Keep in mind that the latest audio device drivers, and the latest recording software are designed on the most current version of XP. If your computer isn’t up to date, it’s performance will likely suffer. Go to windowsupdate.microsoft.com to easily update your installation. It may take a few visits to the site to get all the fixes to the updates (install updates and then do the Windows Update scan again). Minimize Programs running in the background. The icons at the bottom-right of the screen, next to the clock (mostly) represent programs that are running in the background. This will include virus protection spy-ware protection etc. While recording, it is advisable to exit from these. Right-clicking any of these icons will bring up a menu. If there is a Close, Exit, or Quit option for any of these icons, choose it so that you have exited out of any background programs. You can double-check what applications and processes are running by looking at the Applications and Processes tabs of the Task Manager. To access the Task Manager, press Ctrl+Alt+Delete, and then click Task Manager. Turn off Hard Disk Sleep. Make sure your Hard Drive is not set to sleep or turn off after a short amount of time. If your hard drive goes to sleep (stops spinning to save power) while you are recording, your recording will be interrupted. Click on the Start Menu at the bottom left of your screen and select Settings, then Control Panel. Open the Power Options control panel. Set the Turn Off Hard Disks option to Never. Turn off Automatic Updates. It can be a good idea to turn off any scheduled tasks. The last thing you want is for a 150MB update to start downloading in the middle of a recording session. Open the Automatic Updates control panel, and select Turn off Automatic Updates. This means that its up to you to manually check for updates yourself. All you have to do is either revisit this Control Panel, or go to windowsupdate.microsoft.com. Turn off wireless networking. Wireless networking can sometimes interfere with or interrupt recording. Wireless cards in computers automatically scan the airwaves for available networks. This takes up some of your system resources, and can sometimes hurt performance. If a removable wireless networking card is being used on a laptop, the card can simply be removed. If you are on a wireless network, and the card is internal, you can disable the card in the device manager while you record. Its easy to turn back on when you’re not recording. When troubleshooting or optimizing system performance issues in Windows 7 and Vista, it is often a good idea to disable some or all of the graphical effects. While they look nice, these effects can actually be just as demanding, or more demanding on your computer's system than many professional level programs available on the market. Performance on even the highest-end systems can suffer if too much demand is placed on the processor(s) at once. Disabling these graphical effects is one step towards getting the highest level of performance out of your existing computer. The Window Color and Appearance control panel will open. Click on Openclassic appearance properties for more color options. The borders of your windows will no longer be clear, freeing up system resources for other programs. In the window that opens, click on Theme. The Theme Settings window will open. Under Theme, select Windows Classic from the drop-down menu. Minimize Programs running in the background. The icons at the bottom-right of the screen, next to the clock (mostly) represent programs that are running in the background. This will include virus protection spy-ware protection etc. While recording, it is advisable to exit from these. Right-clicking any of these icons will bring up a menu. If there is a Close, Exit, or Quit option for any of these icons, choose it so that you have exited out of any background programs. You can double-check what applications and processes are running by looking at the Applications and Processes tabs of the Task Manager. To access the Task Manager, press Ctrl+Alt+Delete, and then click StartTask Manager. Turn off Automatic Updates. It can be a good idea to turn off any scheduled tasks. The last thing you want is for a 150MB update to start downloading in the middle of a recording session. Open the Windows Updates control panel. Then, on the left-hand side of the window, click Change Settings, then choose Never check for updates. This means that its up to you to manually check for updates yourself. All you have to do is either revisit this Control Panel, or go to windowsupdate.microsoft.com. Set your Power Options toHigh Performance. In the Power Options, Control Panel, choose High Performance. Then click Change plan settings button, and set Put the computer to sleep to Never. Then click Save Changes. Turn off System Sleep. In the Energy Saver System Preferences Panel, select the Sleep tab, and set the option titled Put the computer to sleep when its inactive for to Never. Turn off Hard Disk Sleep. In the same System Preferences Panel, uncheck the option titled Put the hard disk(s) to sleep when possible. Turn off AirPort. In the upper-right of the screen, next to the clock, click the AirPort icon, and select Turn AirPort Off. The airport automatically scans the airwaves for available networks. This takes up some of your system resources, and can sometimes hurt performance. Its easy to turn back on when you’re not recording. Turn off Bluetooth. In the Bluetooth Preferences Panel, uncheck On, and uncheck Discoverable. Its easy to turn back on when you’re not recording. Turn off Time Machine. If you use Time Machine to back up your computer (which is a great idea), turn it off when you’re recording. Your Mac may pick some inconvenient times to start a backup. Select the Time Machine System Preferences Panel, set Time Machine to OFF. Its easy to turn back on when you’re not recording. Turn off unnecessary startup items. In the Accounts System Preferences Panel, under Login Items, uncheck any items you don’t need open everytime your system boots. Quit any unnecessary applications. When recording, make sure to exit out of any programs unrelated to your current project. This will free up the most memory possible for your recording apps. 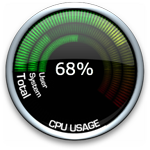 You can monitor how much of your computer’s resources any program is using with the Activity Monitor Utility (located in Applications > Utilities). Every recording program has an options, settings or preferences page in which the user can adjust the buffer size. Buffer size governs the amount of time the computer is given to respond to requests (for audio processing in this case). The larger the buffer size, the more time the computer has to respond. Large buffer sizes allow the computer to handle more work, but at the cost of higher latency. Smaller buffer sizes reduce the overall amount of work the computer can handle, but it can do so with lower latency. Latency refers to the time it takes the computer to respond to input. If latency is high, signals routed into the computer and back out to speakers or headphones may be audibly delayed. Buffer sizes should be adjusted in increments of 64 (64, 192, 128, 256, 512, 768, 1024 etc). All Alesis recording interfaces include Steinberg’s Cubase LE 4 recording Software which allows you to record up to 8 inputs at a time, and mix-down up to 48 tracks. While the instructions below apply to the included software, they are easily adaptable to virtually any recording software program (i.e. Sonar, Logic Pro, Digital Performer or Ableton Live). Note: Before you follow the steps below, make sure you’ve properly set up Cubase LE with your audio interface by following out Cubase LE4 Setup Guide. In Cubase LE 4, select the Devices menu at the top of the screen and choose Device Setup. On the left-hand side of the window that opens, select VST Audio System. Now, on the right-hand side of the window, next to Audio Buffer Size choose the buffer size which is appropriate for your situation. 128 or 192 for ultra low latency. Use this when monitoring MIDI or Guitar input through a VST instrument or Plugin. 1024 if you are using the Alesis HDM Control Panel to monitor inputs, or to maximize performance for projects with many tracks and/or plugins. If you are troubleshooting dropouts, use this setting. 512 for a middle-road with medium-low latency and for projects with low to medium track/plugin counts. A good example of latency is the time it takes for the computer to output a sound when a key is struck on a MIDI keyboard connected to it. In this situation, it is important to have low latency so that there is no audible delay between the time the key is struck, and when the note is heard. Another situation in which it is important to have low latency is when using an amp-modeling plug-in for guitar or bass. The guitarist or bassist plugs directly into the audio interface, and uses a software plugin to emulate the sound of a guitar amplifier. Any delay between the time the player plucks a string and the time the note is heard would be disruptive to the performance. In the modern digital studio, these two situations are essentially the only times in which it is important to have very low latency and buffer sizes. Depending on the computer, a buffer size of 192, or 128 should result in very low latency suitable for the above situations. A properly configured iO|14 or iO|26 can exhibit latency as low as 6ms. The human ear can not distinguish delays lower than 20-30ms. All Alesis recording interfaces (and many other InMusic class-compliant products) feature zero latency input-monitoring. This makes monitoring live audio sources like microphones, keyboards, basses, MPCs etc effortless. When monitoring inputs like these, do so using the audio interface’s zero-latency monitoring feature as opposed to monitoring through the recording software. This way latency is never a factor. The Alesis iO|14 and iO|26 feature a sophisticated zero-latency monitoring utility - the Alesis HDM Control Panel. This gives you four completely independent monitor mixes! The MasterControl allows you to create a zero-latency monitor mix right on the control surface’s faders. You can instantly switch back and forth from monitor mix control, to software DAW control by pressing the Direct Monitor button. When switching form one mode to another, the motorized faders snap right back into position where you last left them. The MultiMix USB, iMultiMix USB, MultiMix USB 2.0, and MultiMix FireWire series of recording interfaces all feature integrated zero-latency analog mixers giving you full control over what you hear while you’re recording. The iO|2 features a Monitor Mix knob that allows you blend a zero-latency input signal into your mix. The only situations in which it is necessary to monitor through the recording software (as opposed to the HDM) are described above: monitoring MIDI input through a software instrument, or monitoring guitar through an amp modeling plugin.